By activating market forces, Cotton made in Africa (CmiA) aims to create better working conditions for hundreds of thousands of African cotton farmers and workers at the start of the textile chain in Africa and to protect the environment in the cotton growing regions. To achieve this, CmiA links small-scale farmers and factory workers worldwide with producers throughout the textile value chain, textile companies, brands and consumers. The Cotton made in Africa label on the product is a symbol of this goal and visualises the cotton grown by smallholders in line with the social, environmental and economic sustainability standards of Cotton made in Africa in international trade. Cotton made in Africa, which was founded in 2005, is one of the biggest standards for sustainable cotton. It supports sustainable cotton growing in Africa in order to protect the environment and create better living and working conditions in the cotton industry of sub-Saharan Africa. The scheme gives international textile companies and brands access to a high-quality raw material for their products that can be easily incorporated into the textile value chain worldwide, and it enables them to create transparency in their chain. Around 30 international textile companies and brands currently buy CmiA-certified sustainable cotton for their collections, combining sustainability and efficiency in a profitable way. The small Cotton made in Africa label on a product tells consumers that their purchase is benefiting both the environment and people in the cotton growing countries. CmiA works with more than 695,000 small-scale farmers in nine countries, training them in sustainable growing methods, business management and social issues such as child labour and gender equality. More than 280,000 tonnes of ginned CmiA-certified cotton were harvested in 2016, making CmiA the biggest sustainable cotton label in Africa. About 30% of all cotton production in sub-Saharan Africa is now CmiA certified. More than 5.7 million people from CmiA countries of production benefit from the initiative. The average CmiA farmer grows cotton on a plot of about 1.5 hectares. 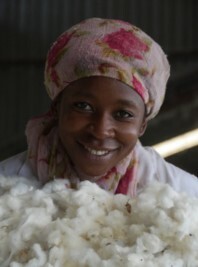 Cotton is one of the principal sources of income for smallholder families in sub-Saharan Africa. By comparison with the global average for conventional cotton, each kilo of CmiA cotton saves more than 2,100 litres of water and causes up to 40% fewer greenhouse gas emissions. Some 30 companies in the textile and fashion sectors that source Cotton made in Africa cotton for their products put about 50 million CmiA textiles on the market. The revenue from licence fees per textile increased by comparison with the previous year (+47%). CmiA is globally represented and available through the worldwide network of 13 cotton traders and 69 CmiA-registered spinning mills and textile producers. The stakeholder network comprises NGOs such as WWF, Welthungerhilfe, NABU and Care International, donor organisations such as the German Investment Corporation (DEG), the Gesellschaft für Internationale Zusammenarbeit (GIZ) on behalf of the German Federal Ministry for Economic Cooperation and Development (BMZ), 69 registered CmiA spinning mills and textile producers, 13 cotton traders and a number of other stakeholders in the cotton and textile sector.